People worry about attending a sexual health clinic as they usually find the experience embarrassing. As doctors, there is no point in us telling patients that there is nothing to be embarrassed about when it comes to sexual health as the fact is that the majority of people are not comfortable with the subject. So rather than patronising people, we have established The STI Clinic, which is an online sexual health clinic and provides patients with a reliable alternative to their local GUM clinic. The lab that we use is an accredited pathology lab in central London that is used by a large number of private doctors across the UK. Simply choose the type of test that you want from the menu on the right of this page. If the particular test that you are looking for is not there then call our helpline on 020 7125 0367. Once you have paid for your test kit, it will be sent out to you by post. You can request first class post or guaranteed next day delivery. 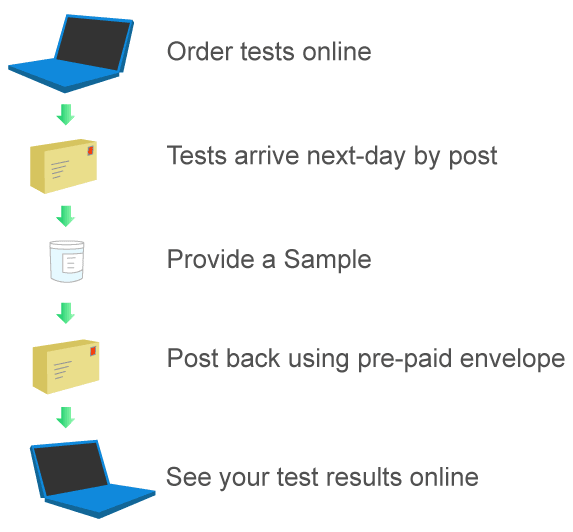 When you receive your kit, provide your sample in accordance with the instructions and post it back to our lab in the pre-paid envelope along with the pre-completed lab request form. Your results will be uploaded to your secure area on our website for you to login and retrieve them. In most cases, this happens within 24 hours. How is Your Service Different from my local GUM Clinic? The STI Clinic performs STI tests by post. The method of testing that we use is known as PCR testing. PCR is a very accurate way of determining if a particular organism is present in a urine sample. The main difference between The STI Clinic and a local NHS GUM Clinic is that we can test for common bacteria such as Mycoplasma Genitalium and Ureaplasma Urealyticum. NHS clinics do not have the ability to test for these increasingly common sexually transmitted infections so a full screen with The STI Clinic is more comprehensive than a full screen with your local NHS sexual health clinic. We can organise treatment through a partner clinic if you test positive. The treatments are sent by guaranteed next day delivery. Will you inform my Doctor? We will never inform your GP of your STI test results unless you request us to do so. Is Discretion Assured at this GUM Clinic? Absolutely! All packaging is plain, with no mention of The STI Clinic or our company on the outside. Everything is marked Private and Confidential. There is no way that anyone would be able to work out what is on the inside. Only you will have access to your sexual health test results. Only you have your personal login and you choose your own password. You can have your results sent via SMS but this is optional.